The GM Place spectator sports and entertainment facility originated as a P3 proposal which included full design and construction services, financing and operations. 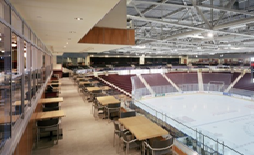 The facility was designed to accommodate all of the design aspirations of the City of Oshawa, including 5500 seats, expansion capabilities, 23 corporate suites, a hall of fame, a second practice ice pad, a two storey restaurant which provided street animation on the main façade of the building, and full use as an independent restaurant with street access on non event days, and the OHL team offices. 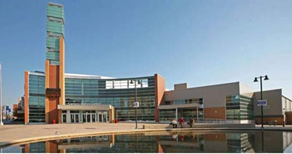 The building responded to the intent of reviving the east end of the downtown with a public entry plaza with a fountain / ice rink feature, and a signature tower structure to create a beacon at night and orient the residents of Oshawa to this site. The project site which had been occupied by a series of industrial buildings was selected as the best brown-field design/build project.